This is still not right: the big purple leaf in the center is too big, central, and contrast-y; it instantly draws the eye and fixes it there. Â The curve still feels a bit static, and the sizes/colors don’t fully satisfy me. Â But I think it’s better than what I had earlier. Â I will play around more tomorrow morning and see if I get any further. Â I may also play around with twisting and curling the leaves around a soft wire frame, to make them more three-dimensional. Â There are lots of options, and I feel like I’ve only just begun to explore. In the end, I think I will wind up making a bunch of small leaf appliques and then arranging them in place; it’s really going to be hard to get things right with rough-cut simulations. I did, incidentally, test what happens if you continue the leaves further down. Â As I had suspected, it’s too much: it just looks busy. 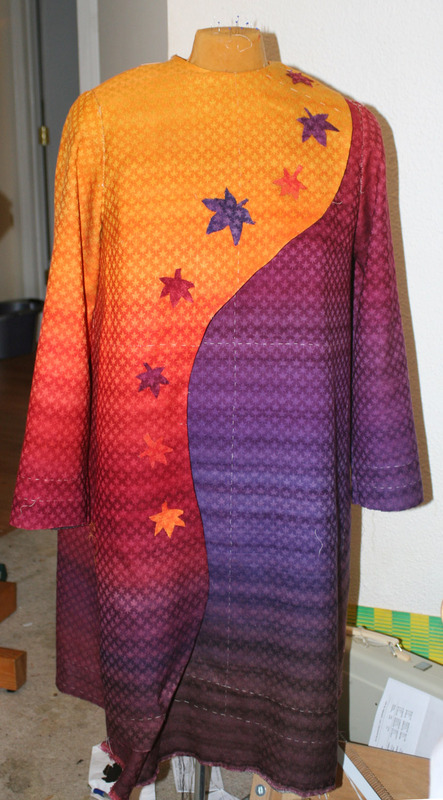 Today I also did most of the handwork needed for the outer shell of Autumn Splendor: I’ve re-understitched the facings, trimmed the seams and given them a hard press, adjusted the neckline, and re-hung the sleeves. Â All that’s left is to remove the basting (no trivial task, since every seamline has three hand-basted lines in it! ), apply the leaves, and hem the outer shell. 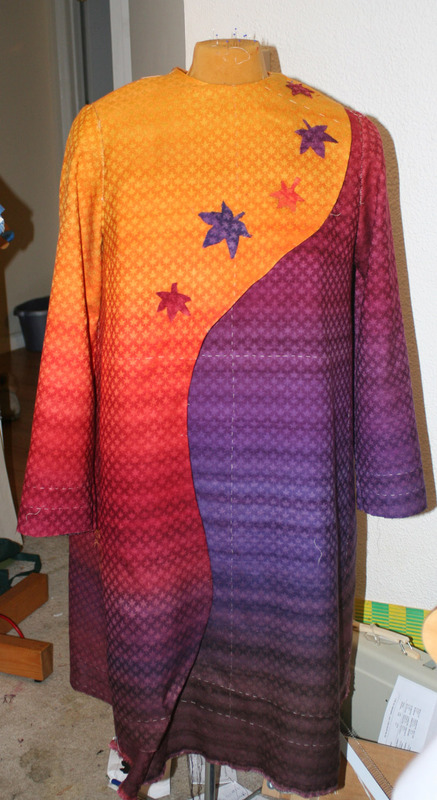 Â Then it will be on to the lining! I’m probably throwing a monkey wrench into designing but I like the leaves falling all the way down the front the best. I’ve been watching this process and am eager to see what you finaly decide on.